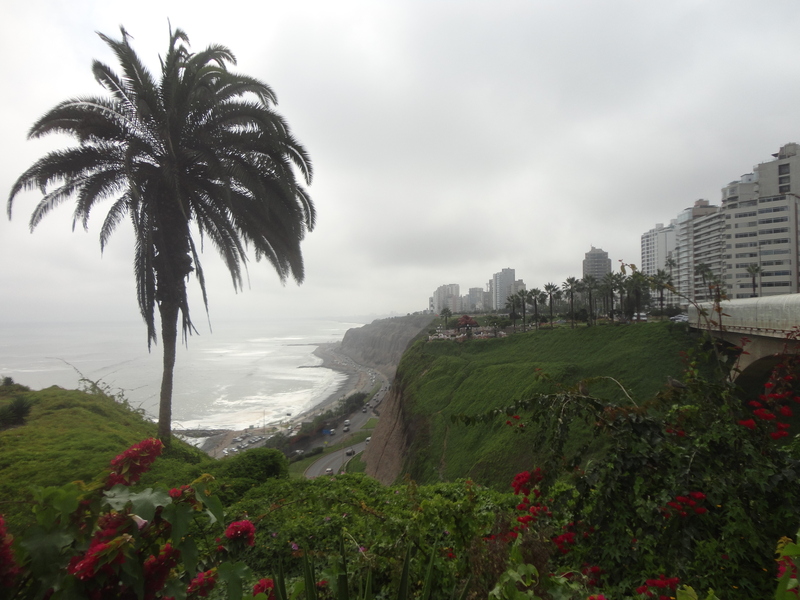 Lima is cosmopolitan modernity veiling traces of the city’s erstwhile eras. It is culinary sophistication, shopping and nightlife, and glassy skyscrapers enveloping what is left of its old traditions and historical architecture after centuries of earthquakes, wars, violent insurgency, and general political unrest. 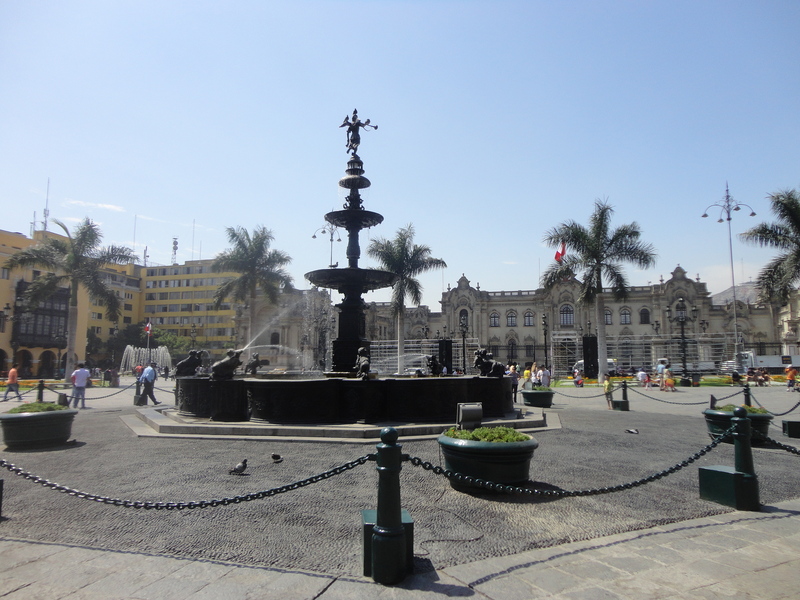 Constructed in 1650, the fountain in the middle of the Plaza Mayor is the oldest surviving structure in the plaza area. 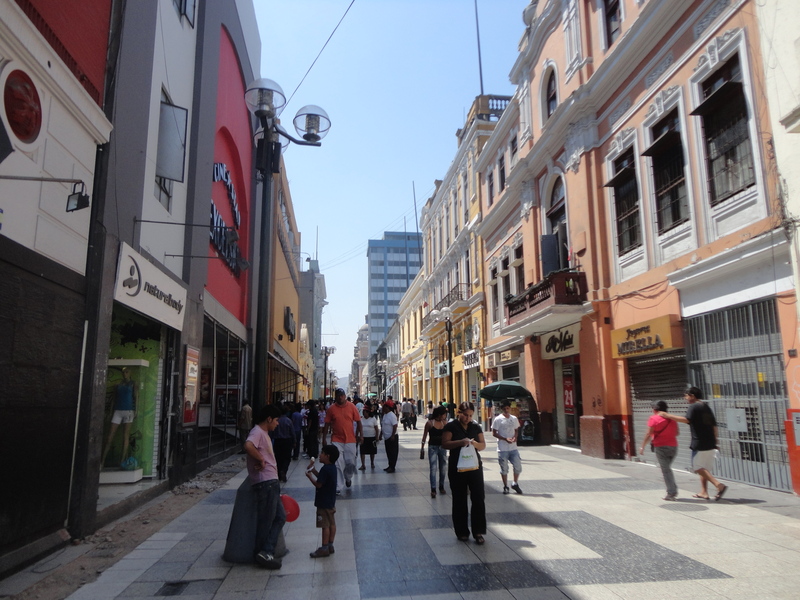 My first few days in Lima were spent in the Lima Centro district exploring the surviving historical heart of the city. What is today called the Plaza Mayor was the site of the city’s founding in 1535 and became the center of Spain’s rule in South America. It is also the spot where General San Martín of Argentina declared Peru’s independence from Spain in 1821. None of the plaza’s original buildings stand today, but it does exhibit some impressive historical buildings built during the epoch of colonial rule and ensuing years of independence. The president’s house, the baroque Palacio de Gobierno, was built in 1937 and commands the entire far side of the plaza. The archbishop’s palace, the colonial-style Palacio Arzobispal, was built in 1924 and boasts covered Moorish-style balconies. 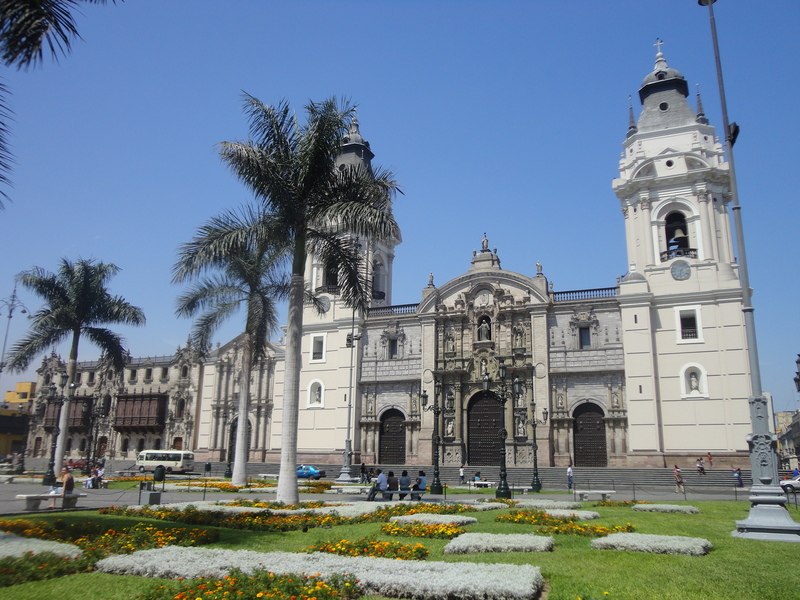 The archbishop’s next door neighbor, the Catedral of Lima, flaunts a baroque facade from its original structure built in 1551. Most of its remaining elements have been rebuilt several times due to frequent earthquakes that jarred the city over the years. Cornflower blue, carnation pink, and sunshine yellow colonial mansions and churches make up the neighborhood surrounding the Plaza Mayor. During my aimless circuit of the plaza and its bordering grid of streets, I found myself at the Parque de la Muralla. My initial impression of the park was that it was too much concrete and not enough greenery. But then I discovered that the rocky grounds are actually unearthed glimpses into ancient Lima. 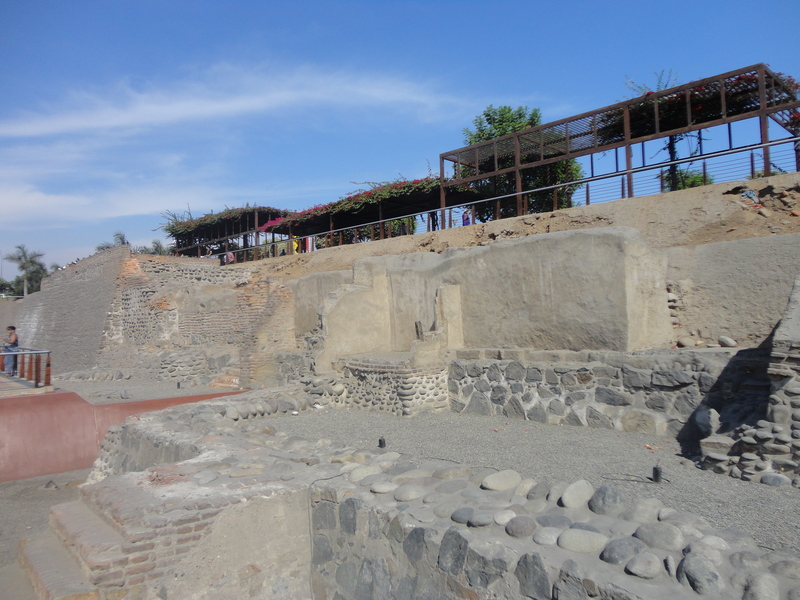 The park was built around an excavated part of the muralla, or “city wall,” that enclosed Lima in the 17th century. When the city expanded in the late 19th century, the wall was torn down, but apparently the demolishers didn’t complete their job. Along with remnants of the muralla, the ruins of a 17th century house form the concrete attractions in the park. I strolled back to my hotel via the Jirón de la Union, a five-block pedestrian alley connecting the Plaza Mayor with its younger comrade, the Plaza San Martín. The promenade that was the place to see and be seen in the late 1800s is now also a happening place of shopping and milling about. Satisfied with my reconnaissance of Lima’s architectural history, I decided it was high time I got a taste (literally) of the fare that is responsible for Lima’s renown as the gastronomical capital of South America. Gastón Acurio is a celebrity chef who helped make Peruvian cuisine gourmet, opened a dozen restaurants around the globe to serve this nouveau culinary creation, and succeeded in bringing international attention to a cuisine that has been enjoyed by Peruvians for hundreds of years. The illustrious chef just so happens to own my favorite San Francisco cevichería, La Mar, which is also the select place in the city to savor (or guzzle) pisco sours. Obviously I had to experience a meal at one of Señor Acurio’s hometown restaurants while in his hometown. 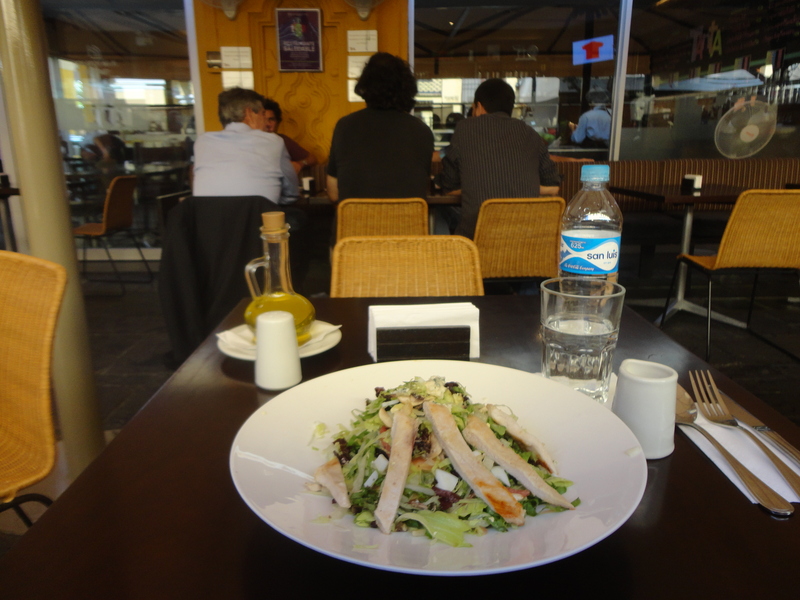 I chose T’anta, a cheerful bistro that was playing the local fútbol game for a bevy of business lunchers. It was a pleasant soundtrack to my even-better-than-expected salad. 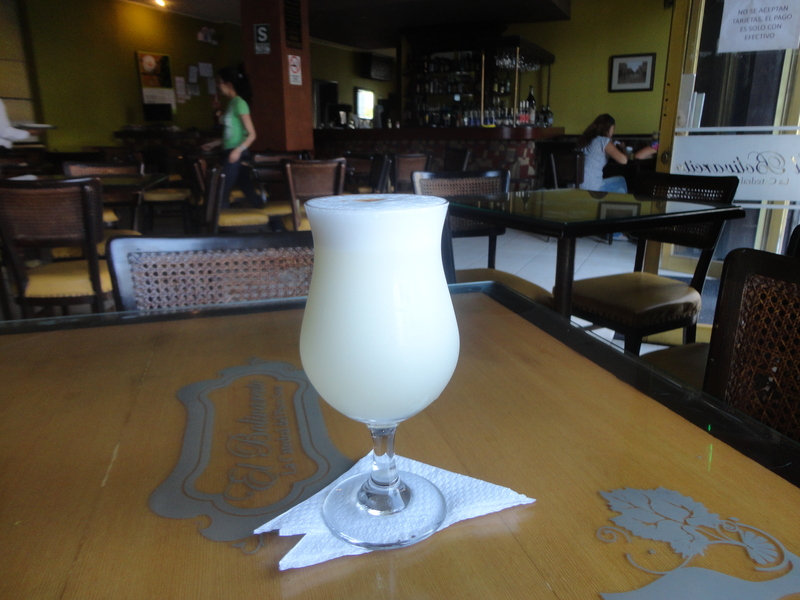 My afternoon of research into Peruvian gastronomy would not be complete without a pisco sour. El Bolivarcito is a bar in the landmark Gran Hotel Bolivar, a historical hotel of luxury that hosted Hollywood stars and other elite travelers in its prime years of the mid-1900s. The bar is famous for galvanizing the pisco sour as the national drink. I figured this would be the best place to degust a Peruvian pisco sour with all of its historical lustre. 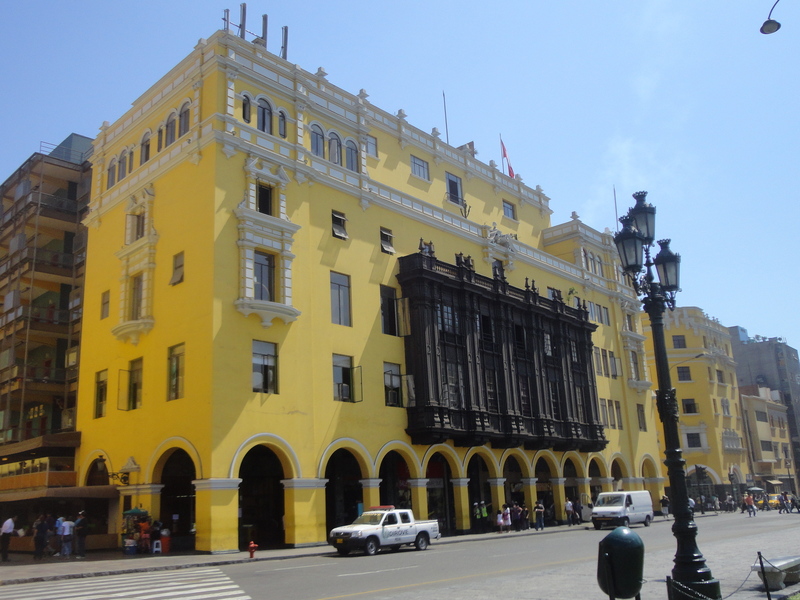 From my window table at El Bolivarcito, I sipped on the bar’s signature “La Catedral” pisco sour and gazed at the Plaza San Martín across the street and its quarter of pristine white beaux art buildings. There was an extra spring in my step as I sauntered home that evening with a slight pisco buzz. My historical tour accomplished, it was time to forage into contemporary Lima. I carted my luggage to a hotel in the trendy Miraflores, a coastal neighborhood that is the hub for shopping, eating, and nightlife in Lima. Settled into my new hotel, I rambled along the coastline on a clifftop esplanade. 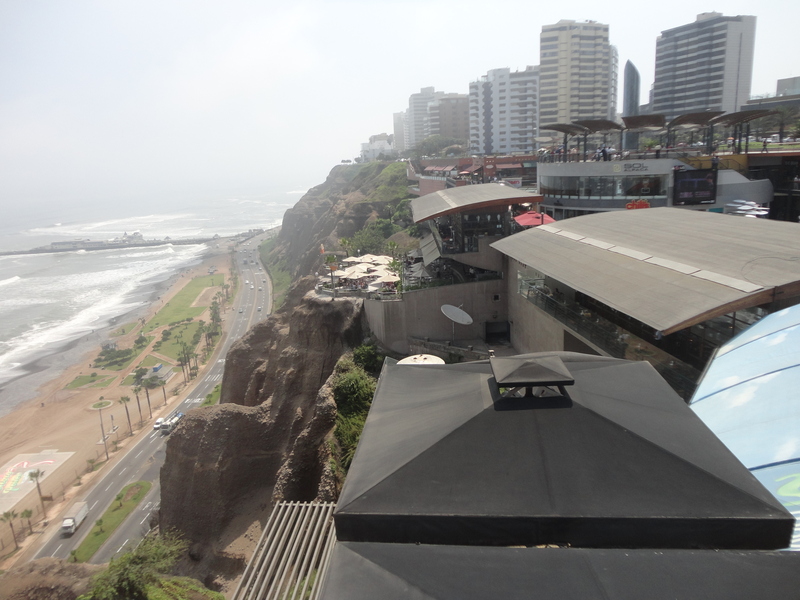 The seaside walk took me right into Larco Mar, an outdoor mall built on the jagged cliffs overlooking the Pacific. I really had no choice but to browse around the upscale boutiques of the mall, working up an appetite for a lunch of Peru’s national dish, ceviche. The cliffside mall is home to a stretch of restaurants with outdoor ocean-view terraces. I picked a respectable-looking one and lucked out with a perfect corner table that was practically sailing over the water. 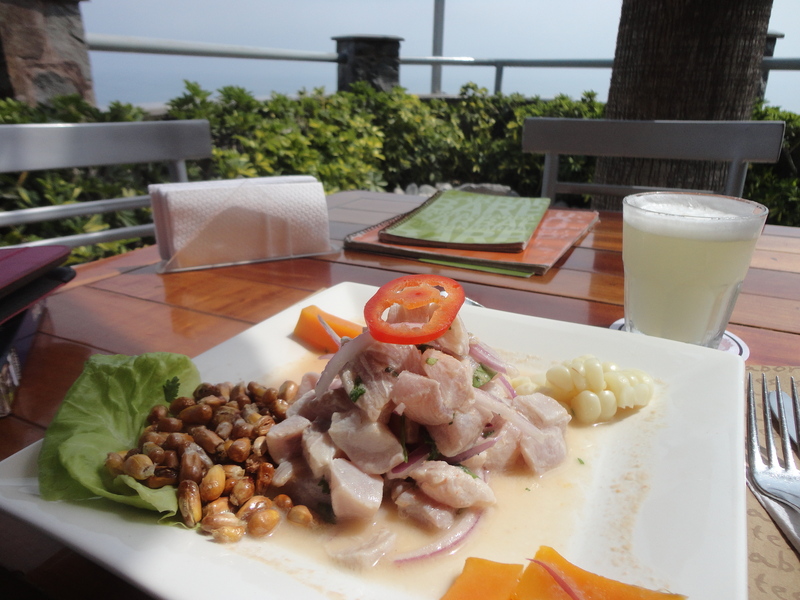 My enormous plate of ceviche was absolutely delicious but difficult to finish, even for my normally bottomless stomach. I didn’t have the same problem slurping up my pisco sour. 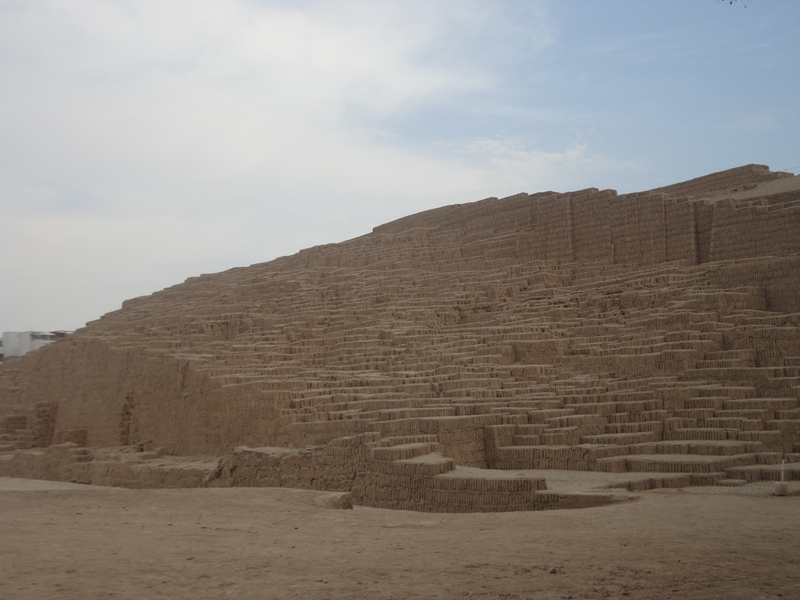 After continuing along the water for a while past parks and highrise condos, I meandered inland to look for the ruins of Huaca Pucllana, the one historical attraction in modern Miraflores. A restored adobe temple dating back to the 5th century, it mostly just looked like a huge stack of bricks in a pyramid shape. I normally would have been more impressed with such an old structure, but I was having too much fun attempting to partake in the fashionable life of Miraflores to appreciate the historical allure of the ancient construction. I prolonged this fun with a trip to the salon. 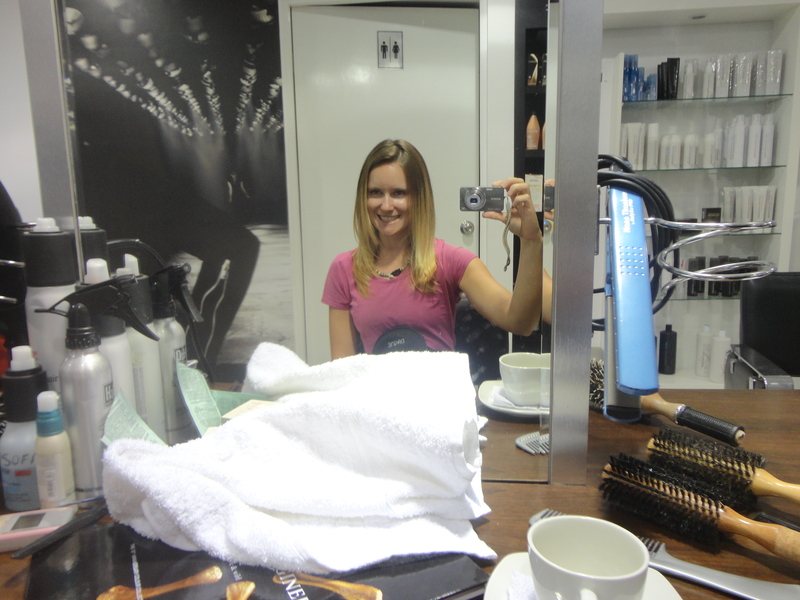 My hair was in dire need of a trim, and it turns out in Peru, you can get a fabulous haircut at a hip salon for Supercuts prices. Going to the salon is one of my favorite indulgences at home. It is even more fun when you are traveling, on a budget, and can treat yourself without breaking the bank. Needless to say, it was a glorious evening at Voce Peluquería. 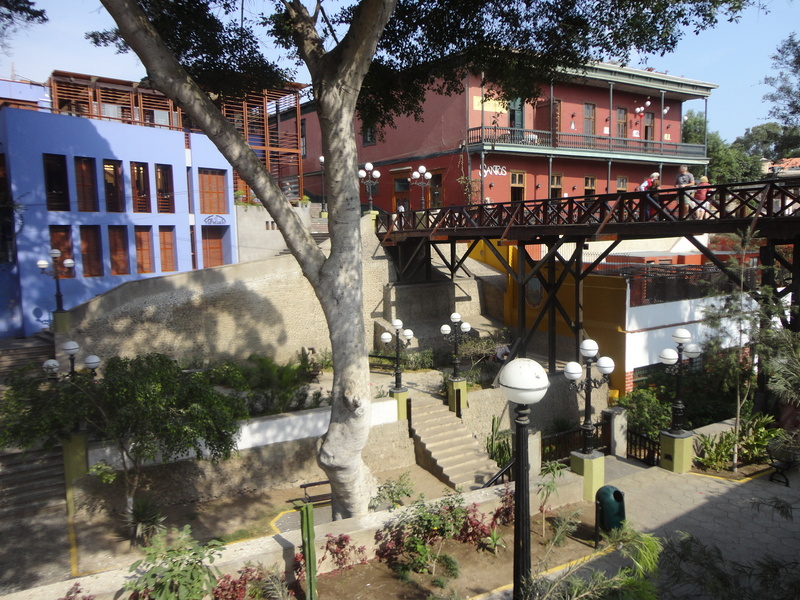 Just south from Miraflores along Lima’s coastline is Barranco, a bohemian neighborhood that was an exclusive resort community in the late 1800s. I thought it would be a good spot for a run along the coast, but it is so high-class that all of the seaside streets are gated shut for access by residents only. Nevertheless, it was an entertaining run loping by the grand colonial houses and over a pedestrian bridge that extends across a cove of restaurants tapering down to the beach. Now that I have seen the old and new of Lima, I am heading to the mysterious on Easter Island.